Do you dream of a "Charmed Life?" Well, we have a collection for you! 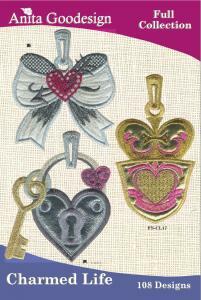 Dress up any t-shirt or tunic with these great charm designs. We created some fun samples with towels. First we created a shoe bag to carry your shoes to gym and then we made a cute bag from a towel, perfect for that wet swimsuit. Have fun and see what kind of projects you can come up with for these stylish "Charming" designs.